Fulbrighter Daniel Shain, Rutgers University-Camden chair of the Department of Biology and a member of Center for Computational and Integrative Biology at Rutgers University–Camden, can trace the roots of research that has dominated his career for 25 years to a stop at a diner in Alaska for lunch during a trip with his father. On his placemat he spotted an ad for a tourist attraction that claimed to showcase worms living inside a glacier, away from typical sources of nutrients near the surface. It was an assertion that interested Shain, who had already dedicated his career to studying segmented worms called annelids. On a whim he decided to visit the tourist site, where he saw thin, thread-like worms thriving in a glacial encasement. The stop turned the study of glacial ice worms and other organisms living in frozen conditions into a major focus of his work. Now, in his laboratory at Rutgers University-Camden with occasional trips to Iceland, Shain is trying to replicate the genetic modification to withstand extreme cold in other organisms, which could potentially make use of land considered too cold and barren for farming and agriculture. "It's important in science to include lesser studied organisms,'' Shain said. "When you pursue these somewhat unusual, outlier organisms, you'll find they have a lot to offer." An international collaborative research grant from Rutgers Global and a Fulbright Scholar Program grant has made it possible for Shain to pursue his research in Iceland, where he is engaged in a multidisciplinary, collaborative research project with colleagues at the University of Iceland. "I ended up in Iceland looking for anything that lives in a glacier," Shain said. In the process Shain and his colleagues discovered two species of bdelloid rotifers, a class of microscopic animals commonly found in freshwater lakes, rivers and stream – but not inside hard-packed glacier ice. "Most animals have a few hundred types of cells to worry about. It's not like bacteria or other single-celled organisms that only have one cell to modify," he said. "To get all these cells to adapt at the same time is much harder, so few multicellular animals, like rotifers, are found in extreme hot or extreme cold environments." Perhaps most perplexing about their discovery is the fact that bdelloid rotifers are asexual, eliminating the possibility of genetic variations that could have aided the evolution of these commonly aquatic, mild-climate creatures into cold-tolerant beings. But rotifers can evolve through a process called "horizontal gene transfer," where an individual can absorb the genetic qualities of its food or other type of transferring agent. In this case, the species of bdelloid rotifers found in ice were thought to have feasted on bacteria and algae – single-celled organisms that can withstand extreme temperatures. "They're sort of famous for stealing DNA from other species that they eat," he said. "We've also found a related species of bdelloid rotifers in hot springs, as well." Shain continues to collaborate with University of Iceland evolutionary computational biologist Einar Arnason to examine the rotifers' DNA sequence and pinpoint which parts of the genome have changed to facilitate their adaptation to ice. 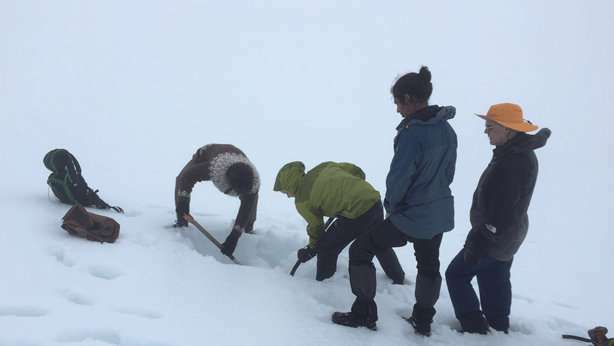 The team is also studying ice worms found in the field. In examining collected species of ice worms, they found that they actually expended energy – instead of storing it – while thriving in extreme environments. "It's something that is a signature of cold adaption – you have to figure out a way to make a lot more energy. So, we've biochemically dissected and identified the key enzymes that are different, and we can try to recreate the same property in other organisms and make them cold-tolerant." The team is attempting to engineer a fruit fly with the enzyme to see if it can also withstand cold temperatures, and, Shain said, this genetic modification could potentially make use of land currently unsuitable for farming. The enzyme that could make plants and insects cold-tolerant could also serve as a possible treatment for humans with energy-deficient diseases like Leigh's Disease, a progressive and sometimes fatal condition that causes paralysis and impaired cognitive and organ function. Shain plans to connect with colleagues in places like Iceland and Poland to look at glaciers in Greenland, Norway, Scandinavia, Uganda and Ecuador, as well as hot springs in New Zealand, to see what discoveries these areas could yield. "International research is equivalent to combining two disciplines – when you combine fields, you get something you wouldn't be able to get if you pursued each independently. When you collaborate with international colleagues, it opens doors and ideas and opportunities."